TJFP is sending love and condolences to the family, friends and community of Blake Brockington. 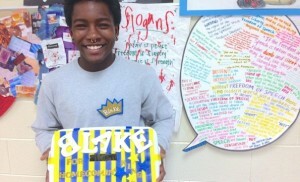 Blake was active in cultural change work, direct action and doing so much for his community. CHARLOTTE, N.C. — Friends and community members are today mourning the passing of a local transgender youth activist, Blake Brockington, who died as the result of suicide overnight. Brockington, 18, was a 2014 graduate of East Mecklenburg High School where, last year, he was nominated and later crowned homecoming king as an openly transgender student after winning a fundraising competition and drawing in $2,335.55 for a charity chosen by the school. Brockington’s homecoming win is believed to be the first for an openly transgender student in Charlotte. Youth in need of immediate support can call the Trevor Project helpline at 1-866-488-7386 or access resources online at thetrevorproject.org.